Fashion is one of the most vibrant, creative, and influential industries in the world. If you want to make it your career, though, it can be an arduous road. 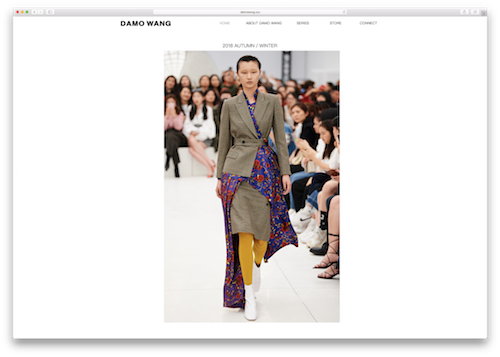 If you’re looking for a success story from the fashion industry to inspire you to pursue your designer dreams, then this week’s #WebsiteWednesday is for you: DAMOWANG.xyz. DAMO WANG was created in 2015 by fashion designer Da Mo and his friend Alex Wang while the two were students at Beijing Institute of Fashion Technology, and a mashup of the pair’s names served as the inspiration for the brand’s moniker. Da Mo had already established himself as a name on the Chinese fashion scene, having worked for 10 years at another top fashion brand and creating his own clothing label ICYSOUL in 2012. Since it’s launch, DAMO WANG has followed an impressive path to success and popularity. At the Shenzhen Original Design Fashion Show in 2016 and 2017 DAMO WANG was awarded Best Designer and Best Commercial Potential Brand, respectively. DAMO WANG’s styles have been worn by famous Chinese actresses like Han Xue, Liang Jing, and Yao Xingtong. Feature stories covering DAMO WANG’s work have appeared in major press outlets like Sohu.com, Fashion.ef360.com, HaiBao, Fashion QQ, and China SSPP, and have garnered millions of views. This meteoric rise to the top of the industry is well deserved, and it’s clear the catalyst behind DAMO WANG’s success is their rebellious, forward-thinking attitude. “By extracting fashion fragments and methods of overlapping, DAMO WANG reshapes the concepts of avant-garde and fashion, while in the meantime reflecting magnificence and sexiness, and bringing back delicacy and elegance. Therefore, it overthrows the over-simple value orientation of traditional designer brands, and creates a brand suitable for women today who have more and more identities. DAMOWANG.xyz is a window for our customers to understand us more comprehensively and intuitively, to better enhance the brand effect, to acquire business opportunities, and to provide better customer service. DAMO WANG is proof that when you combine your passion with hard work and a clear vision, you can take your career to amazing heights. 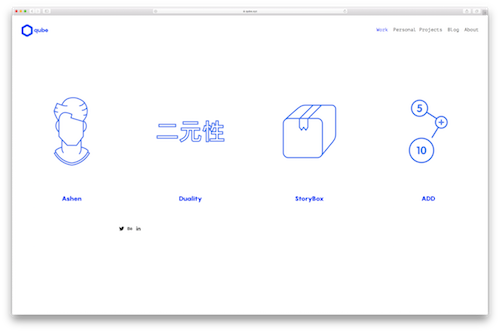 Once you’re ready to bring your brand online, you can get your own .xyz domain to build a unique and powerful online identity, just like DAMOWANG.xyz. This week’s #WebsiteWednesday is a treat for both domainers and startups alike. Morgan Linton is an entrepreneur, angel investor, tech fanatic, and domain industry veteran. While many of our readers will know that Morgan has been sharing his thoughts on the domain industry via his website MorganLinton.com, Morgan has always been a passionate member of the startup community. 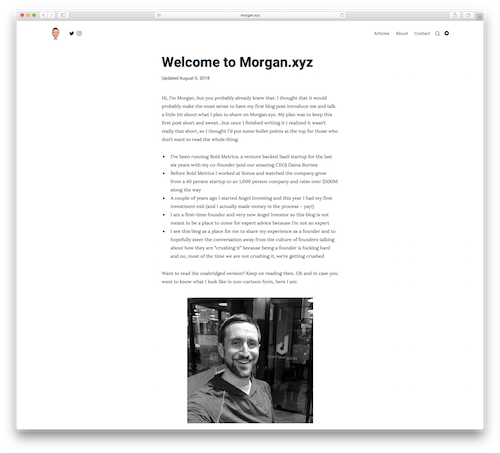 Now, he’s sharing his thoughts, advice, experiences, and more via his new personal blog website Morgan.xyz. Morgan’s unique perspective has been sought after for years, as evidenced by his appearances at TEDx Rome, on NPR’s Marketplace, in StartupBeat, and many other publications. Now, he’s sharing his insights on the ever changing startup landscape, specifically as it pertains to investing and emerging technologies, via Morgan.xyz. Morgan took some time to sit down with us and give us a bit of insight into what readers can expect from Morgan.xyz and share a bit about his own personal journey. XYZ: You’ve had Morgan.xyz since .xyz went live in 2014. Did you have a vision then of what it someday would become? ML: When .xyz came out I knew that I really wanted to have my first name and, to be honest, I wasn’t entirely sure what I would do with it. While I wish I could say that I had some grand vision for what it would be someday, I actually had no idea initially. I just knew that I wanted the brand. XYZ: When did you know that you wanted to devote your career to technology? ML: Probably when I got my first computer. It was a Mac Classic, and even though it had a black and white screen I still used both Photoshop and Pagemaker on it. I couldn’t get enough – safe to say, I was hooked and I haven’t been unhooked since then. XYZ: You’ve spent a lot of time in Northern California, basing your business in San Francisco and growing up in Berkley, but your studies and work experience have taken you around the world. Where has been your favorite place to travel? Can you share a unique story from your experiences trotting the globe? ML: That is a good question and I have an answer that immediately comes to mind – Hong Kong. There is something truly magical about Hong Kong and I have loved visiting the city since my very first trip. The food, the people, the ocean – it has so much great energy and so much going on. It’s safe to say the city has a pulse, and my heart seems to beat at the same rate. Hmmmm, now as for a unique story, that’s a good question. Here’s one I can think of, not from Hong Kong, but from Italy. My first time in Italy I ordered a pepperoni pizza thinking, “wow this is going to be amazing!” When the pizza arrived it had some bell peppers on it – no pepperoni to be found. I asked where the pepperoni was and they pointed to the bell peppers on top of my pizza. That was the day I learned that, in Italian, I had just ordered a pizza with bell peppers on it. Live and learn! XYZ: You’ve been an angel investor for 2 years now, can you share an experience that sticks out for you, and some of the things you’ve learned along the way? ML: Well, my first successful exit this year definitely sticks out. I thought it would be a long time until I ever made any money angel investing, and I actually thought I might lose everything I put in, so that was a nice surprise. The biggest lesson I’ve learned so far is that it’s all about the founders. There are so many people with great ideas out there, but it takes a great founding team to execute on the idea and have the courage to change their idea when something isn’t working. XYZ: You discuss the future of technology often on your blog and specifically delve into how it will affect the future of commerce. What technological advancement do you see on the horizon that you are most excited about? ML: Augmented reality is at the top of my list when it comes to technological advancements that I think are going to change all of our lives. Magic Leap is probably the furthest ahead in this space, and it’s clear a lot of investors also believe in the future of AR given the billions of dollars Magic Leap has been able to raise, all pre-launch. I think it’s going to have a similar consumer introduction as the cell phone. In the beginning people will say, “oh I don’t need that, I can see why tech people would use it but I’m not a tech person.” Then, boom – everyone has one. I can still remember both of my parents telling me, “well I know why you need a phone that does email and has a camera on it, but I won’t ever need that.” Now they both have iPhones. XYZ: How do you balance your passions like domain investing, traveling, and outdoorsmanship with your startup Bold Metrics? ML: The simple answer here is that I don’t balance. I’ve learned that focus is critically important to doing anything well, so I put just about every waking minute into Bold Metrics. That means that I don’t spend much time domain investing, traveling, or hiking/backpacking, even though these are all things I am really passionate about. From time to time I can escape on a weekend and get out in nature which I really love, but outside of that I don’t have much balance. Just ask my friends and family, they’ll tell you – I spend most of my time working. I knew what I was getting into when we started the company and while I know some people who have managed to balance their company and their life, the reality is that most founders have to make their startup their life. XYZ: When .xyz launched, you predicted it would be popular among startups. Flash forward to 2018, and .xyz has been adopted by thousands of startups from around the world, including household names like MIT (Engine.xyz), Deloitte (Exponentials.xyz), and the co-founders of Skype (Starship.xyz). What did you see 4 years ago helped you predict the success .xyz would have in the startup world? ML: Once again, it’s all about founders. I knew Daniel before he started .xyz and was always impressed with his passion and drive. I also am a fan of short, easy-to-remember TLDs, and .xyz felt like a domain extension that nobody would forget. Since Daniel is a successful startup founder himself I knew he would be able to build a brand that startups loved, and it is pretty clear he was able to do that. As I’m learning as an angel investor, bet on the founders who truly impress you. Daniel is definitely one of those people. XYZ: Do you have any other exciting projects that we should keep an eye out for? ML: Nothing for now, but you can get more plugged into some of the exciting things we are doing at Bold Metrics on Morgan.xyz! Morgan’s path to success across multiple fields is a product of his tireless work ethic, his ability to identify trends in tech, and the many invaluable experiences he’s gathered along the way. If you’re a startup founder or budding entrepreneur, Morgan’s advice and perspective can help get you the edge you need to succeed. Just as .xyz is helping the next generation of internet users on the path to success, Morgan.xyz’s “real life” look at entrepreneurship is giving #GenXYZ a guide that can set them on the right track to achieve their dreams. If you want more insight and advice from Morgan, be sure to tune into XYZ’s Instagram story tomorrow, where Morgan will be taking over in this week’s edition of our #TakeoverThursday series and answering your questions! You can also catch up on any #TakeoverThursdays you missed by clicking the #TT archive thumbnail on our Instagram page. This week’s #WebsiteWednesday is a special one for all the gamers of #GenXYZ. It’s National Video Games Day today, a day made to celebrate one of the most fun pastimes we have. XYZ has a handful of passionate gamers on our team, and we’ve been excited to get to attend E3 the past two years. So we thought there would be no better way to celebrate our video game fandom than to highlight just a few of the many .xyz adopters in the video game industry! Virtual Reality gaming is slowly making its way into many homes around the world, but its full potential remains largely untapped. EdgeLab.xyz is pushing VR’s boundaries by using the technology as the base for everything from brand promotion and product presentations to hands on training and in-depth tourism attractions. The firm has been producing award winning work, garnering first place honors at the Coinbusters Hackathon during Milano Digital Week and being named among Lazio Creative’s 100 Best Stories of Creativity. One frustrating limitation of VR is the small space you are confined to while using it. Want to be able to truly walk around in the virtual environment before your eyes? Then you want VRTracker.xyz, a camera system that integrates with your VR system to allow you to move around freely in your room, or across multiple rooms, making the experience a more in-depth and realistic one. 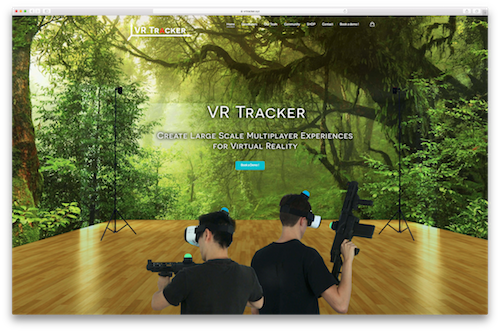 VRTracker.xyz claims their system is compatible with every VR/AR headset in the world, and offer demos, developer support, and a forum for users, all on their site. Many of us who grew up playing video games dreamed of one day being able to design the games ourselves. That dream is a reality for Patty Shannon, a Digital Designer who has molded game and UX design for companies like Aurora44, Storybox, and even the New Zealand chapter of the Independent Game Developers Association. On his site, Patty shows off his work portfolio and his imaginative personal projects, and shares his passion for gaming, along with personal stories, on his blog. 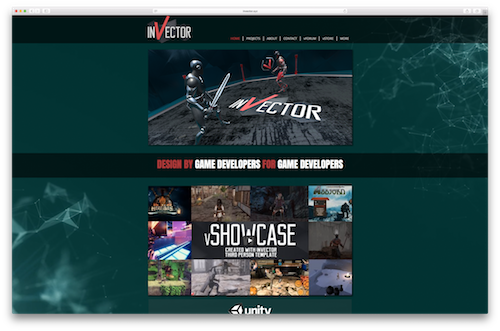 If you’re just starting your journey as a game developer but you need some help getting past a hangup on, say, character combat dynamics or 3D character modeling, then Invector.xyz is the place for you. They have downloadable assets and tools that work right into your game design, giving you exactly what you need to get past the problems holding you back from creating your visionary game. You can buy products directly from their online store, and get help if you need it from their online forum. If you love video games and hope to one day make your career in the video game tech industry, then these 4 .xyz adopters can help show you what it takes to succeed and help guide you through the industry. Video games are a lot of fun to play, but there is a great deal of hard work to be done behind the scenes by the people who design and produce the games we love. Have you started working on your gaming project and want to share it with the world? Then get your .xyz domain today and follow in the footsteps of thousands of other gamers who are pursuing their dreams. Cryptocurrency enthusiasts of #GenXYZ rejoice! Yesterday marks the official launch of .xyz’s inclusion into the Ethereum Name Service (ENS) main network, meaning you can now secure your .xyz name in the ENS and pair it with your Ethereum wallet. This technology was previously available in a beta version but it is now released on Ethereum’s main network, so you can set up your .xyz domain as a custom identifier for your wallet and securely trade or manage your assets using your domain. Now you don’t have to deal with the hassle of sharing or remembering your long, difficult to remember Ethereum wallet key. With your .xyz domain as your custom wallet identifier, you can easily send and receive cryptocurrency on a memorable .xyz domain, and manage your assets securely thanks to the strength of the DNS backbone and the layers of protection available on your .xyz domain. To get more information and answers to frequently asked questions, head to www.gen.xyz/ethereum, or read Ethereum’s announcement here. After cat videos and online shopping, one of the biggest pleasures we get from the internet is being able to find and connect with a community of other people who share our interests and passions. 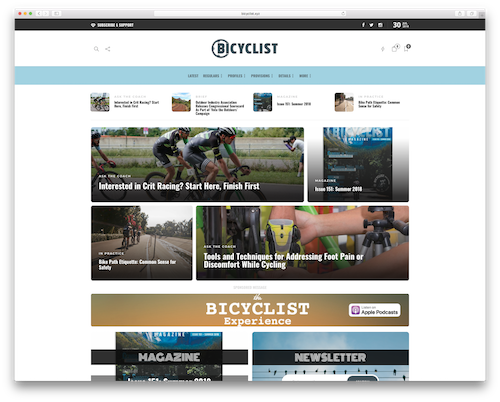 Diving into your favorite hobby with others makes it even more fun to do what you love, and this week’s #WebsiteWednesday is a perfect example of people gathering online to partake in their favorite activity together: Bicyclist.xyz. As their domain name implies, Bicyclist.xyz is a place where cycling enthusiasts can come to get their complete fix of all things cycling. Bicyclist.xyz is an online magazine first and foremost, featuring everything from an online version of the magazine to helpful blog series like “Ask the Coach” and “In Practice.” Plus, they’ve created helpful profiles with different destinations, routes, and ride reports. If you really can’t get enough cycling news, you can also listen to their podcast (which reaches riders in over 72 countries) or sign up for their newsletter for the best bike news and stories delivered right to your inbox. Beyond the magazine, Bicyclist.xyz is also a community that connects riders via a helpful shop locator and the largest online calendar of cycling events, races and festivals in the United States. They have nearly 10,000 followers combined across their excellently branded Twitter, Facebook, and Instagram pages, and use their social media to share a mix of cycling news as well as content submitted by the bicycle fanatics who regularly read their content. “The inspiration for creating Bicyclist.xyz was to provide a digital version of our print magazine and cycling event calendar, both available free to the public at more than 500 better bike shops throughout the west coast since 1994. The site itself offers a platform that guides and inspires people to make the most of their time in the saddle. Our goals for Bicyclist.xyz include reaching more people worldwide and developing improved user functionality for the BICYCLIST Event Calendar, a comprehensive directory of opportunities to join others in organized bike events, races, and festivals throughout the western United States. We come online to get our fill of the things we find most interesting, and it’s even better when we’re able to get that from a community of people who have the same love we do. Harnessing the power of your website to create a special gathering place online is easy, beneficial, and most importantly, fun! Why not get your .xyz domain today and get started creating a space online for your community?